Heartwork is a synthesis of Eastern meditative approaches to healing and Western psychotherapeutic techniques, using awareness as the primary vehicle to see into the source of one’s problems. 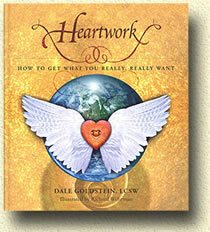 The basic assumption of Heartwork is that our fundamental state is wholeness. Dis-ease is a separation from this wholeness. What we identify as our problems are symptoms of underlying conflicts caused by running away from, or fighting against, certain aspects of ourselves. The tensions created by this internal split may manifest themselves as dis-ease in one or more of the interpenetrating aspects of our being: physical, emotional, mental and spiritual. In each case, these tensions are held in very specific places in the body/mind. The solution to our perceived problems, then, is simply to stop running and to look directly into the heart of the problem by quieting the mind, clearly defining the problem, focusing the attention into the area of the body where the conflict seems to be located, and then looking into the very center of this area to find the resolution. As you look more and more deeply into your experience of the problem, you become increasingly aware of the underlying mental, emotional and spiritual roots of the issue. By allowing yourself to be completely with these split-off parts, you will experience a coming together (a healing or “wholing”) within yourself, in which the dis-ease–producing thought or feeling is released and the problem is resolved. From this place of peace, you are then able to see clearly how you have moved away from your state of wholeness to create the problem that you have just resolved. Understanding, forgiveness and compassion flow freely from this insight, and healing (though not necessarily curing on a physical level) occurs naturally out of this inner ease. This awareness is then integrated into your actions, so that you can live more harmoniously with others and the world. The Heartwork process teaches you to use life’s problems as doorways into a space of open awareness and insight, rather than giving problems the power to run your life.